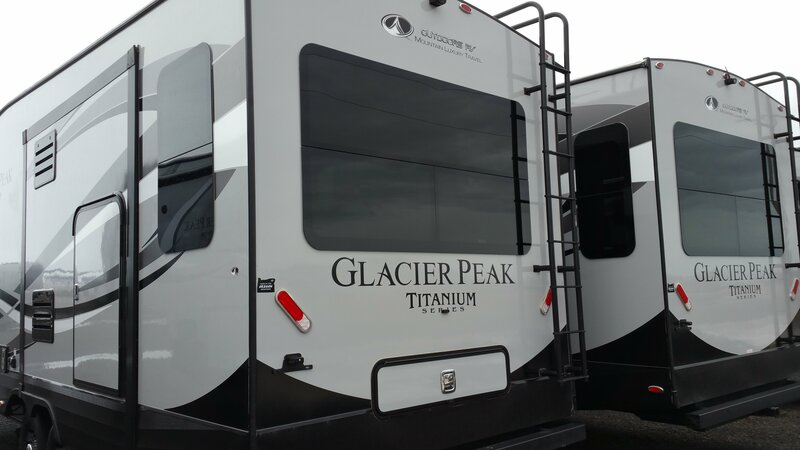 Way back in Sept. 2016 when I first visited the Outdoors RV factory in LaGrande, Oregon and got a “sneak peek” (click to see my original sneak peek post on this trailer) at their new Glacier Peak fifth wheel. Immediately I was excited about their new “project”. 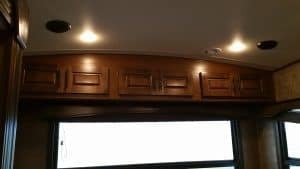 You may know I’ve been living in a pretty good fifth wheel – full time – since 2011 and gaining even more experience with RV’s by working in the RV sales world since 2015. 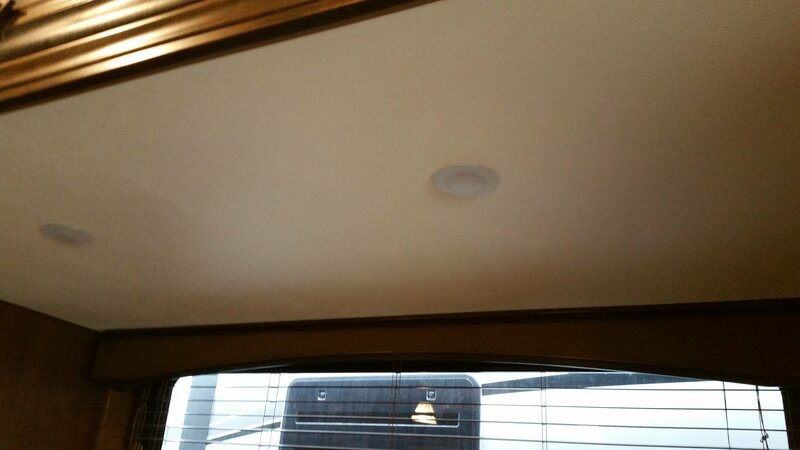 I spend about 1/3 of the year at a RV store in Casper, Wyoming, the other 2/3, I work while I’m on the road. 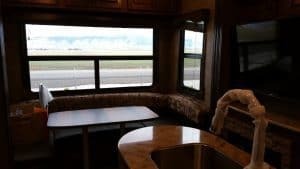 It was in Casper where I was first introduced to Outdoors RV’s trailers (travel trailers and fifth wheels) and saw the “difference” between their trailers and most others. 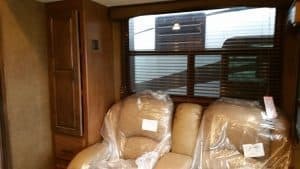 when selecting the best RV for you and your hard earned dollars. 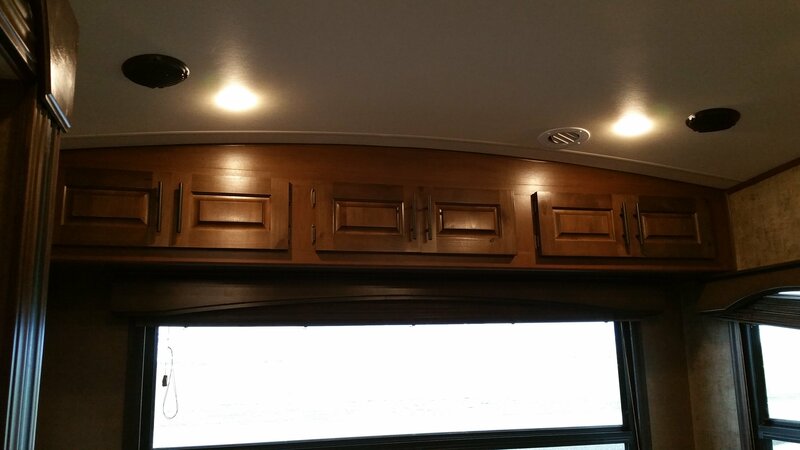 Honestly, there is a lot of mediocrity out there in the RV world! Ask any service tech who works on RV’s! 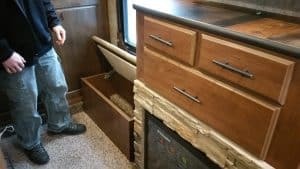 The good news – there ARE a few companies who are dedicated to building a quality product – and Outdoors RV is most definitely among the “select few”. 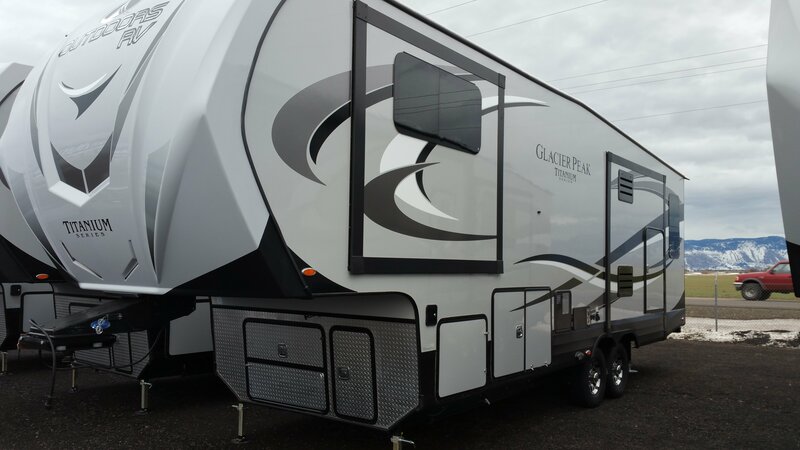 That said, when it comes to my next fifth wheel purchase, I’m not 100% locked into Glacier Peak (made by Outdoors RV) just yet. 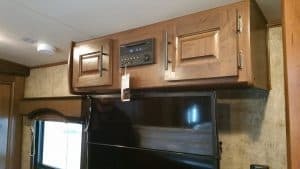 Yes, the dealer I work for carries them, but there is one other product – the Augusta RV Ambition is still in the running for my business. As their factory is in Indiana, I’m not likely to make a personal visit, but since I’m looking for a few specifics (I’ll detail as we move along in this article), I believe a phone conversation with their staff (as they only do factory direct sales) will give me the information I need to finalize my decision. My focus in this article is to share the Glacier Peak F30RDS with you. 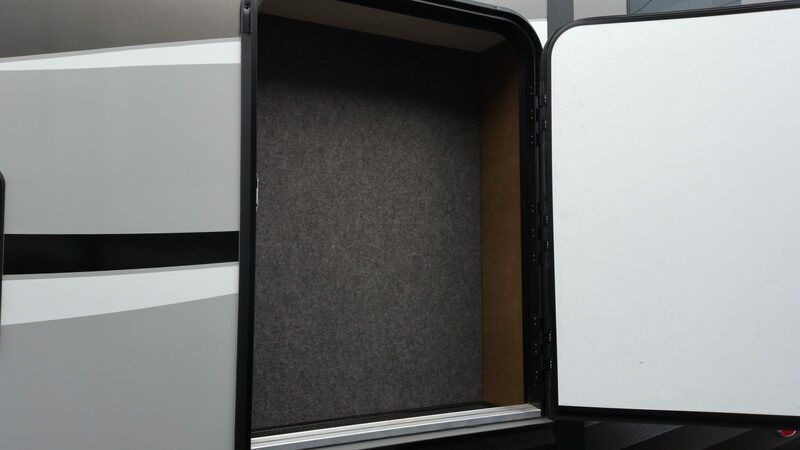 The F30RDS is one of three just introduced “full profile” fifth wheels by Outdoors RV. 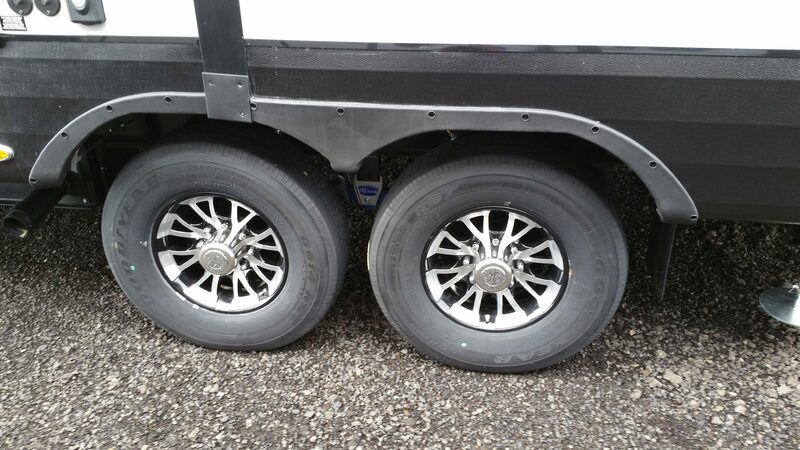 In case you’re wondering, a “full profile” fifth wheel is the larger of the two types of fifth wheels – the other being “mid profile”. 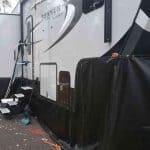 To see the difference, look at Glacier Peak’s 26 and 28 series trailers. Briefly, full profile fifth wheels allow for more space in the bedroom – including closet space; there’s more room for storage underneath, larger refrigerators and microwaves. Features that all full timers would be dialed into – so, to have Outdoors RV release these full profile rigs is honestly an answer to my prayers! 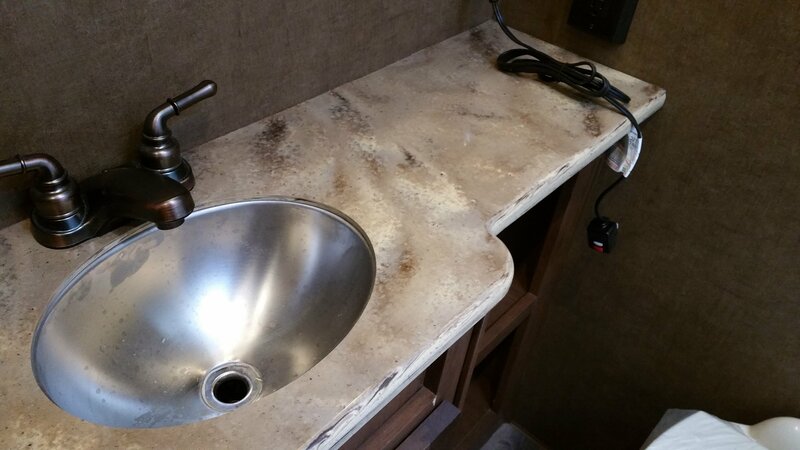 When you read brochures from many RV manufacturers, they’ll tell you their rigs are built to resist leaks for years and survive in nearly the harshest of 4 season environments – hmmm…true in most cases? Simply put, NOPE. 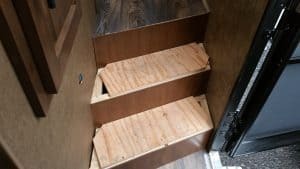 They claim to use the best materials when constructing their trailers, but how do you separate the exceptional from the mediocre, and precisely WHAT should you be looking for? I’m going to use the photo essay below (where I honestly “geek out”) with lots of photos and commentary. Skip to the end if you just want to read my summary. You can click on each photo to enlarge it. Use your browser’s “back” button to get back to the article. 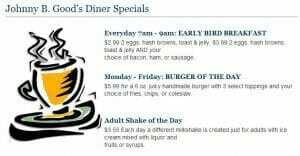 Alternately, you can right click on the images and open in a new tab, this will keep the article in one tab and the image appears in a new tab. Overall, construction is key to me! The use of weather resistant plywood instead of “OSB”, the use of fiberglass where you would not expect it (like under the slides – further protecting your slideouts from weather and other stresses), the use of 2″ thick solid foam instead of fiberglass (pink panther) throughout all the walls (including each slide out wall) in the entire trailer, the use of shocks on the axles – with optional Monroe Air Shocks, this is especially important if you plan to camp in some of the more remote – and best – places! A design that keeps the overall length in check (under 35 ft). 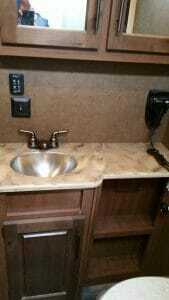 This allows access to some of the BEST camping areas. And there are more factors. Read my comments under each photo, they contain important thoughts I wish to share, in many cases areas where I was honestly impressed. Rear outside storage – as a full timer, I will definitely appreciate this! Outside storage is under the rear booth. Reminder: Click (this or any) image for a larger view. Outside storage under the front cap, in main bays ahead of dual axles AND behind axles. Tank pulls are ahead of axles and NOT located inside the storage bay. 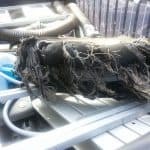 Outdoors RV has found cable systems to be problematic – so they do not use them (I’ve experienced this with my current rig – cable systems CAN be problematic.) 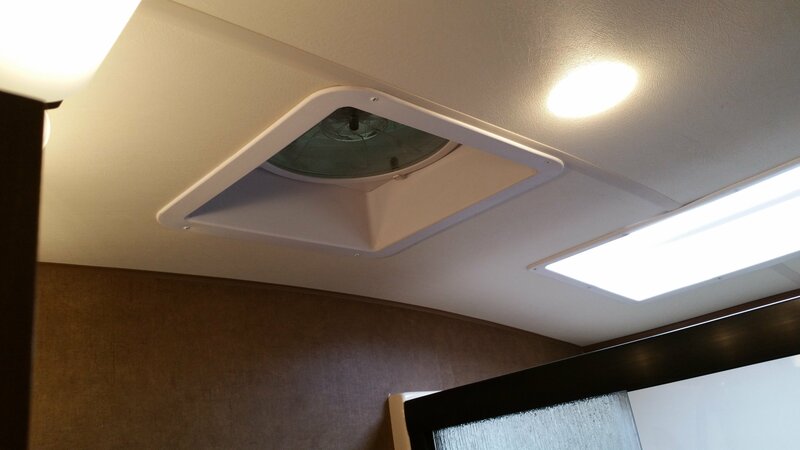 Last – note LARGE panel for OUTSIDE furnace access – VERY important to let you EASILY service the furnace. 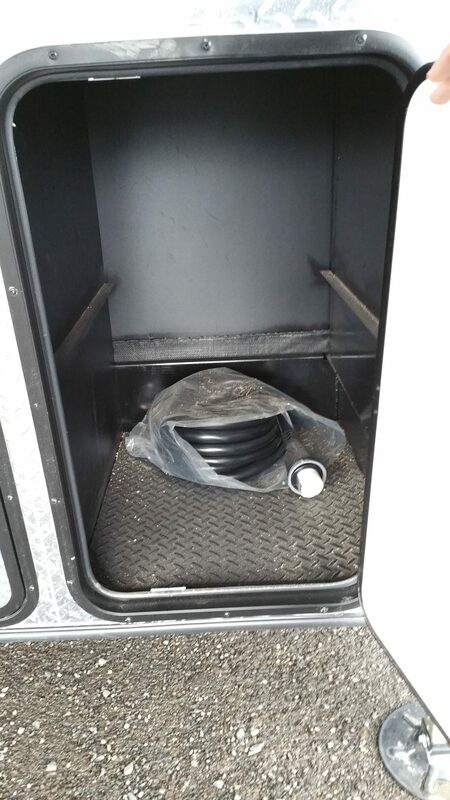 Outside storage behind axles – another area typically NOT found on many RV’s. – Note: This additional storage provided by Outdoors RV is evidence they’re thinking of how to best utilize every square inch in their rigs – space other manufacturers leave inaccessible as otherwise dead space. 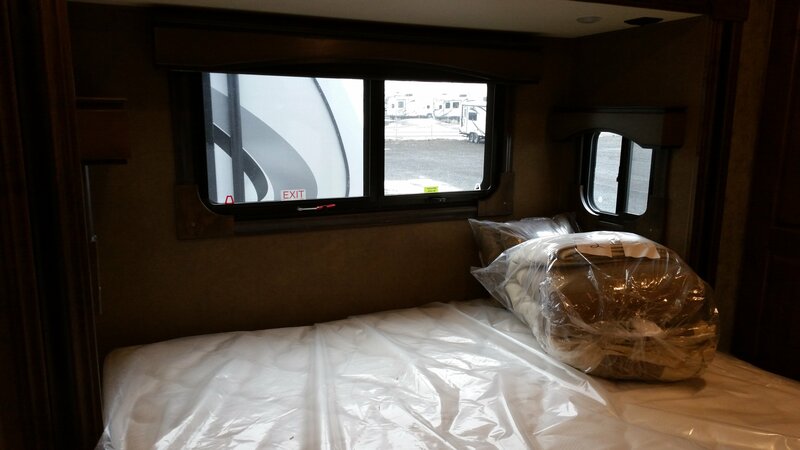 Two inch thick hard foam insulation in the walls AND roof of the slideout – THIS IS IMPORTANT to anyone who is camping in the heat OR cold. 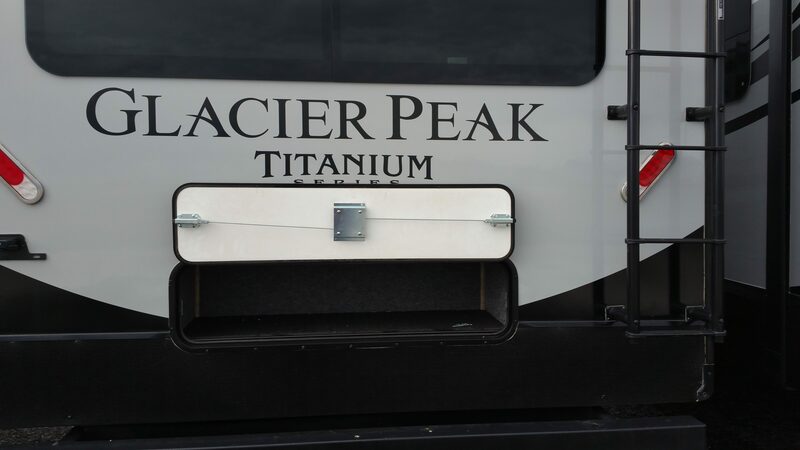 When you walk into a Glacier Peak on a hot July afternoon on the dealers lot, and then walk into most other trailers, the Glacier Peak is a solid 10-15F cooler! Also – solid foam insulation CAN NOT SAG like pink panther fiberglass can. LARGE bay storage. 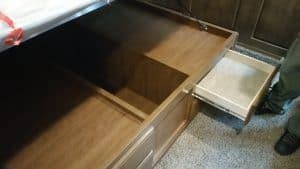 Note the table; heat register; doors on the side to provide EASY access to interior plumbing and the LACK of plumbing obstructing the storage area!! 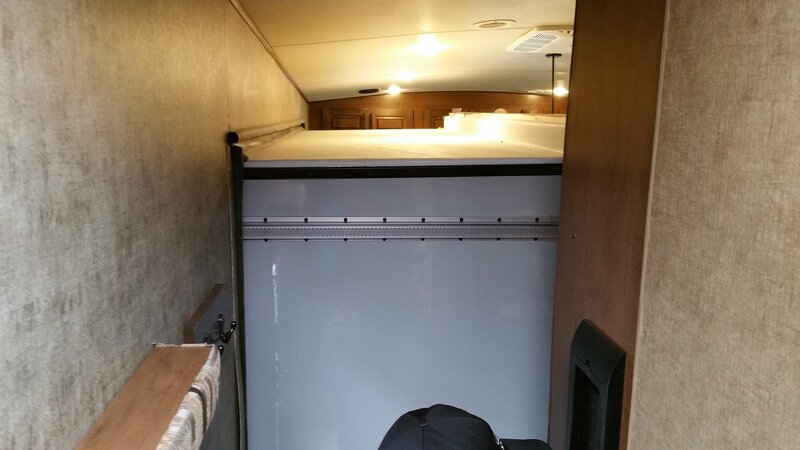 This storage area is about the WIDEST I’ve seen – especially in a 33ft 9 inch rig. NOTE: I’m looking to stay UNDER 35 ft. Why? Longer rigs (from experience) can not get into the BEST and more remote campgrounds!! 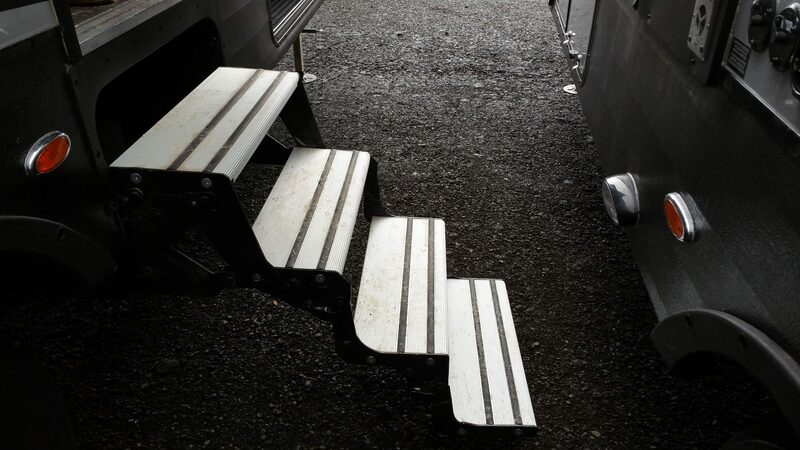 Aluminum Steps – and 4 of them! 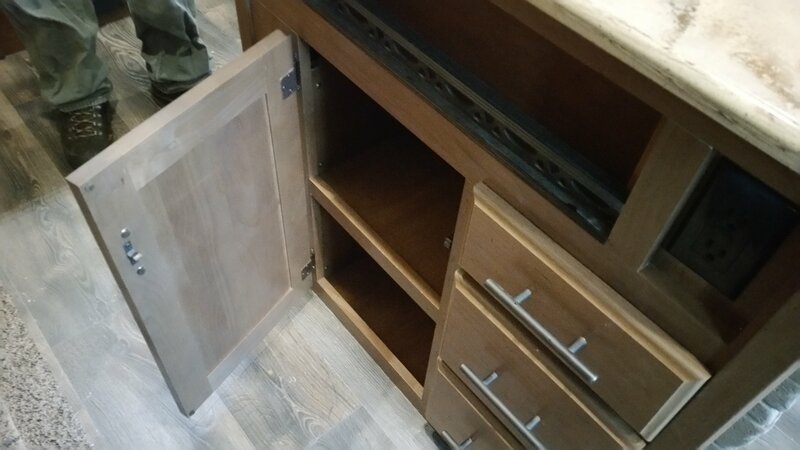 Good counter space with access to 110v, additionally there are 2 drawers and a cabinet next to the oven. 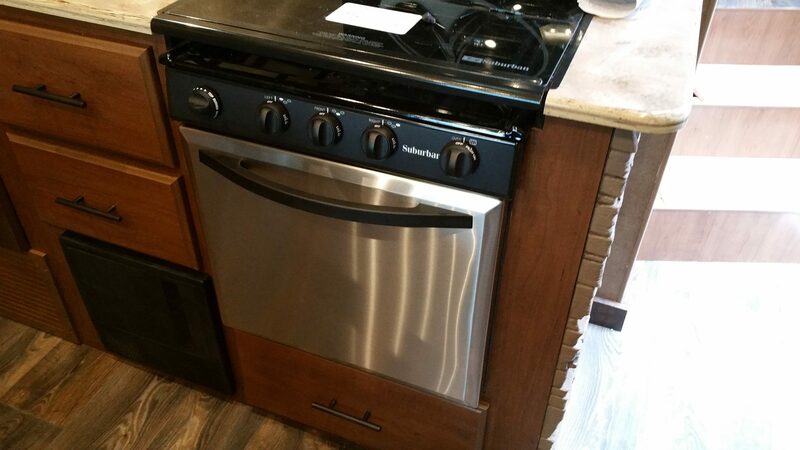 Note the glass cover over the stovetop – can be used to extend food prep counter space. 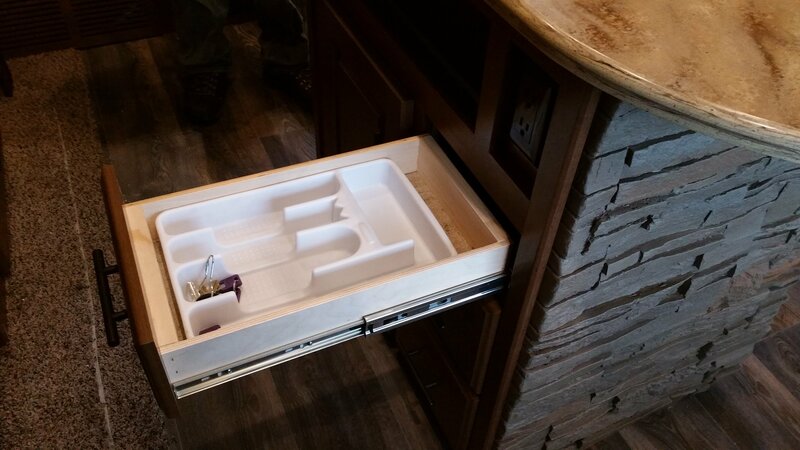 Center island – as I noted earlier, this adds valuable storage below it along with food prep area next to the sink. The faucet fixture is high quality as is the sink itself. Center Island faux rock facade. Note also the beautiful wood flooring. 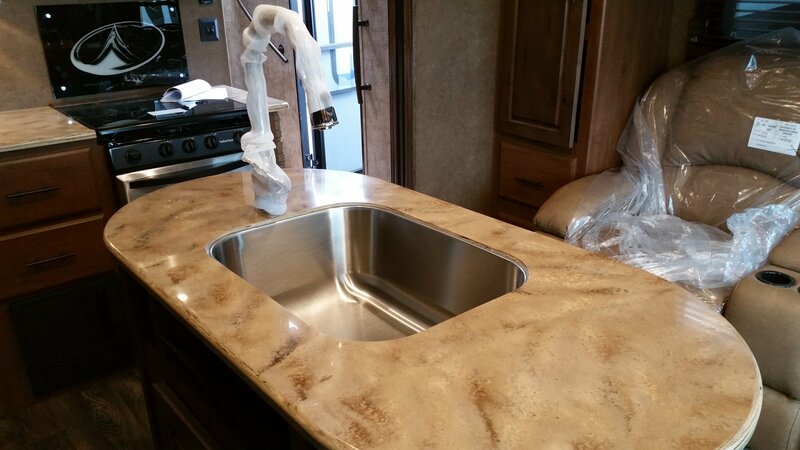 Also in case you’re wondering, all countertops are a high quality solid material (equivalent to or better than Corian). Full Extension Drawers – few manufacturers do as good a job as Outdoors RV on this feature. Recliners/Couch. Note the Pantry next to the recliners with 2 drawers underneath. The recliners are directly opposite the entertainment center. 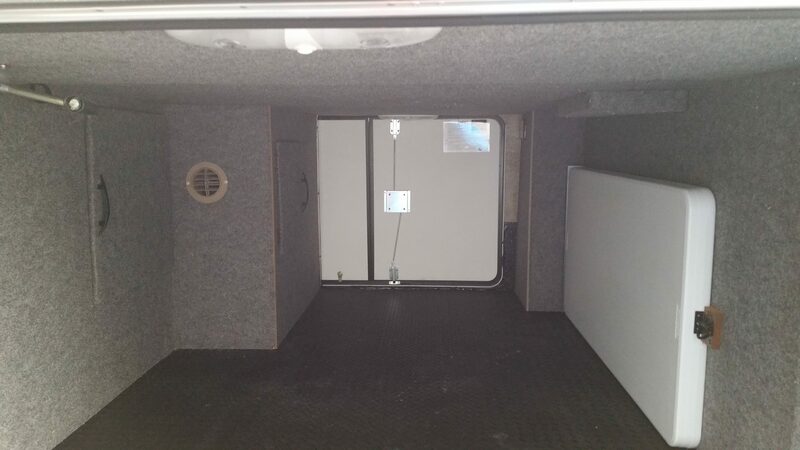 Looking back towards the rear dining area. Note the TV to the right, center island in foreground, and recliners (not pictured) to the left. 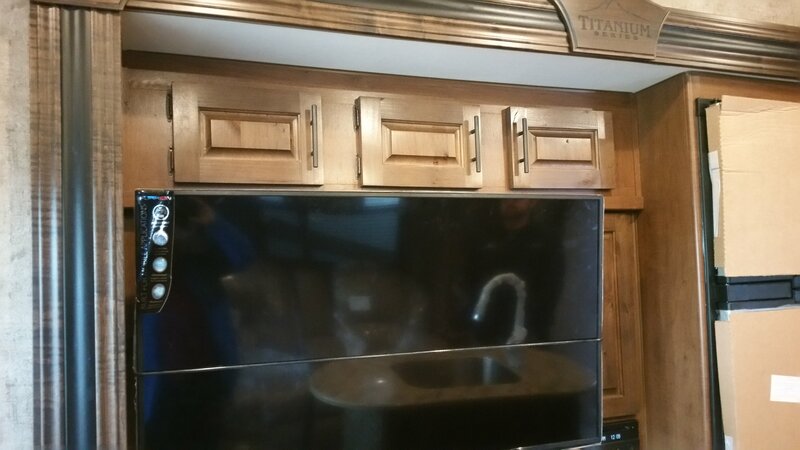 Entertainment Center with optional electric fireplace (1500w heater) and 3 drawers. Note the fridge to the right. 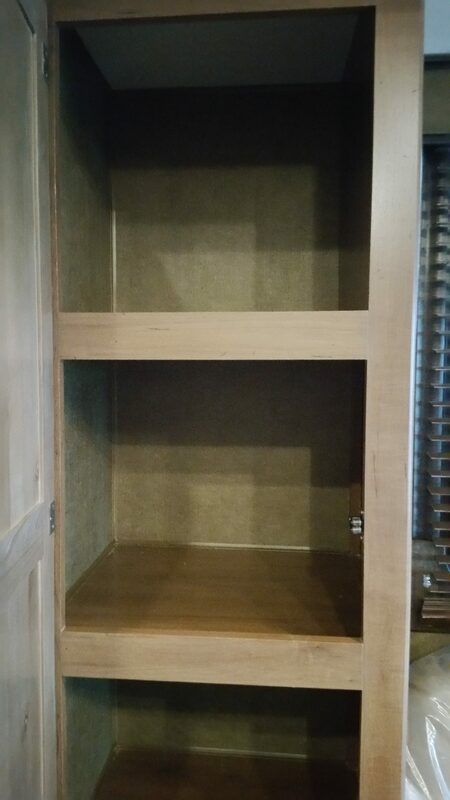 Cabinet storage above the entertainment center. 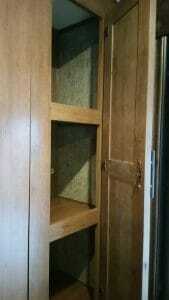 Cabinet storage above rear dining area. Hallway steps to the bathroom/bedroom (unfinished). 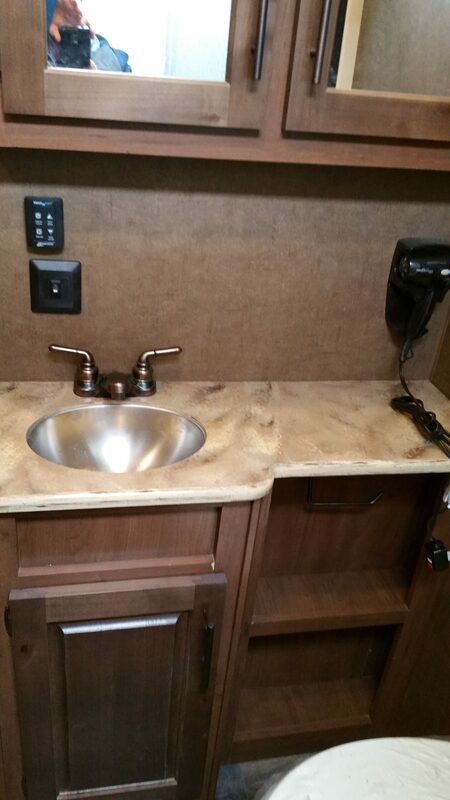 Note the fact that Outdoors RV uses real wood here! 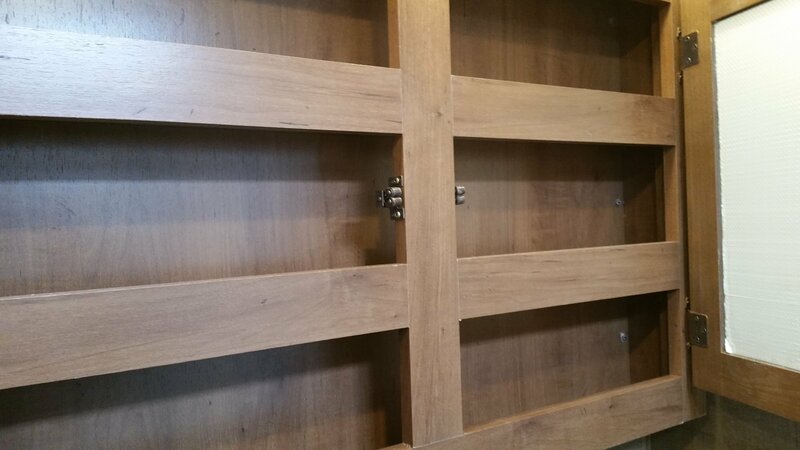 I may modify them to add hinges to provide additional (hidden) storage. Hallway with real brass railings – nice touch! Bathroom vanity – LARGE. Hair dryer (not pictured) on far right. 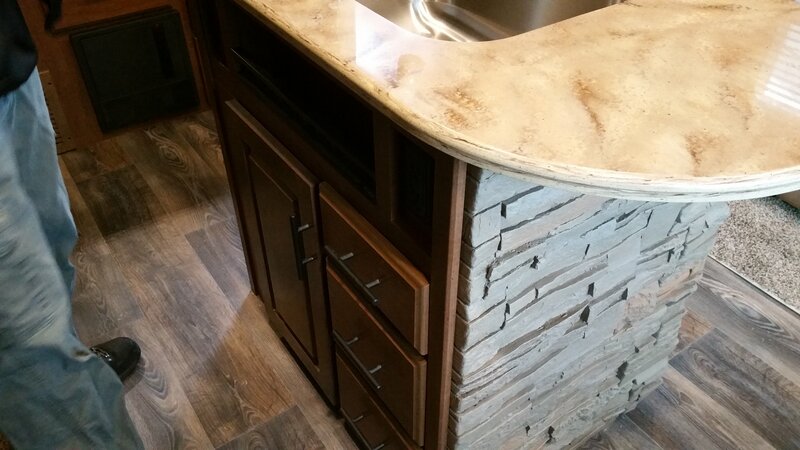 Note high quality countertops here as well – and residential quality fixtures. I saved (perhaps) the best for last. 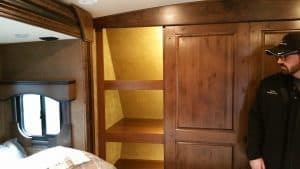 Honestly, I don’t think I’ve seen a bedroom in a 5th wheel with more storage space than I saw in the Glacier Peak bedroom! Take note of how the bed box is designed, the front cap closet, and the dresser and accompanying cabinets opposite the bed. 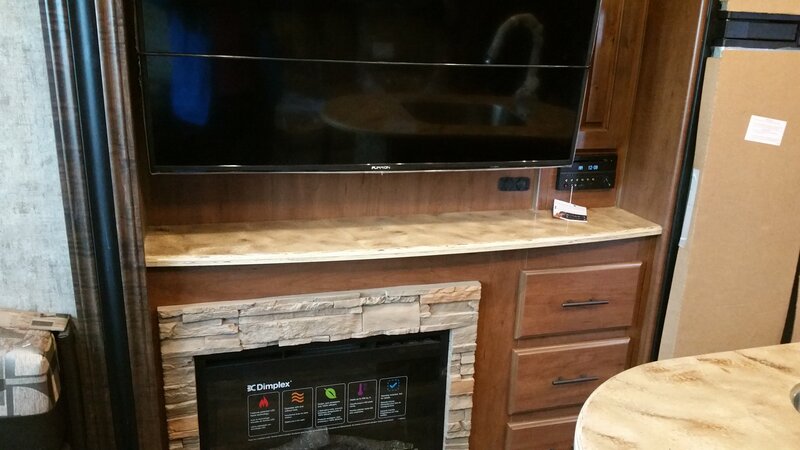 Large 32 inch TV, generous dresser drawer space with an optional fireplace (see photo below). 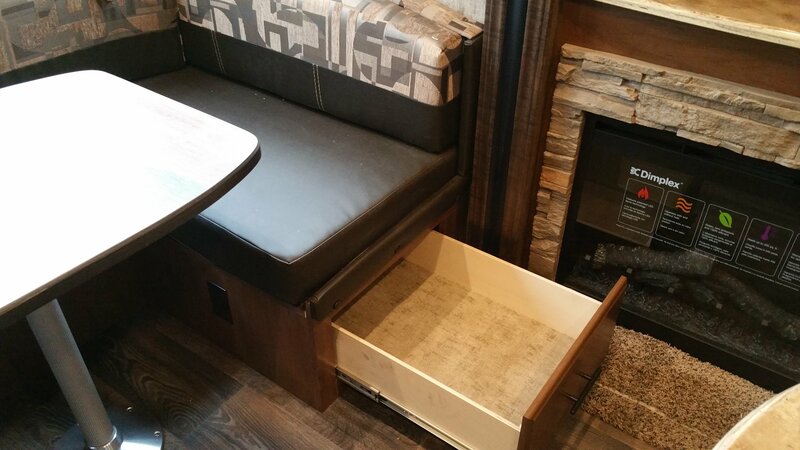 If no fireplace, two additional drawers are provided. 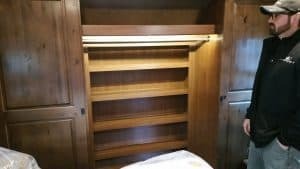 Personally, I do want a fireplace in the bedroom (its an option), instead I will opt for the additional drawers in the Glacier Peak bedroom. Full width front cap closet with excellent latch design. King bed with a very comfortable mattress. A queen mattress is available and with that end tables are provided. Windows are easy to work and found on both sides of the bed. Electric is available on both sides near the floor at the head of the bed. 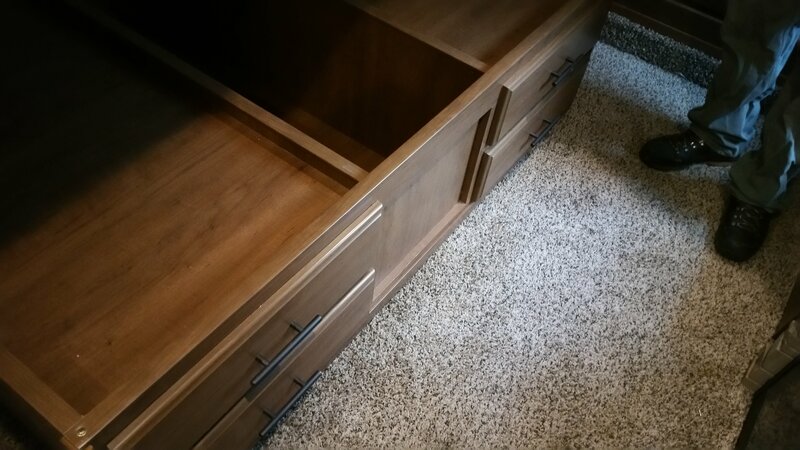 Additional cabinet storage next to the bed. Truly impressive! My initial reaction is to be thrilled with Outdoor RV’s new creation. Naturally, the big test – the test of time is yet to happen. If I decide to “pull the trigger” and purchase this model, I will most definitely keep you posted on my findings. Based upon my experience with their earlier models, I’m expecting only the best in long term results. 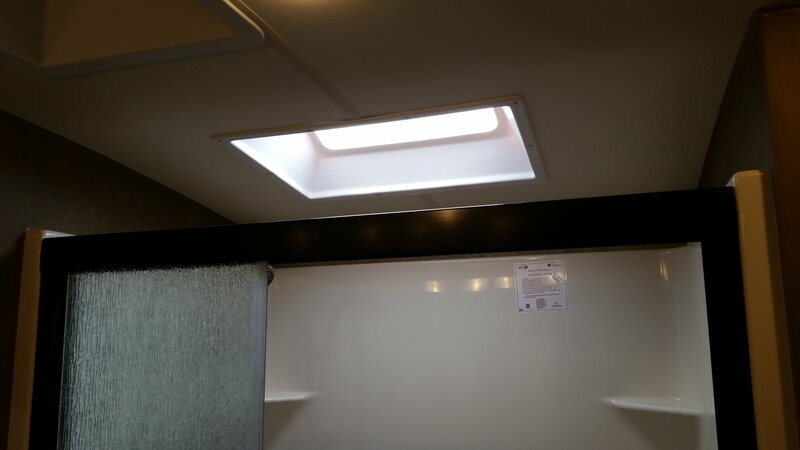 A rubber roof on top of each slide – having lived with “other” for years in cold/snowy winters, it matters! 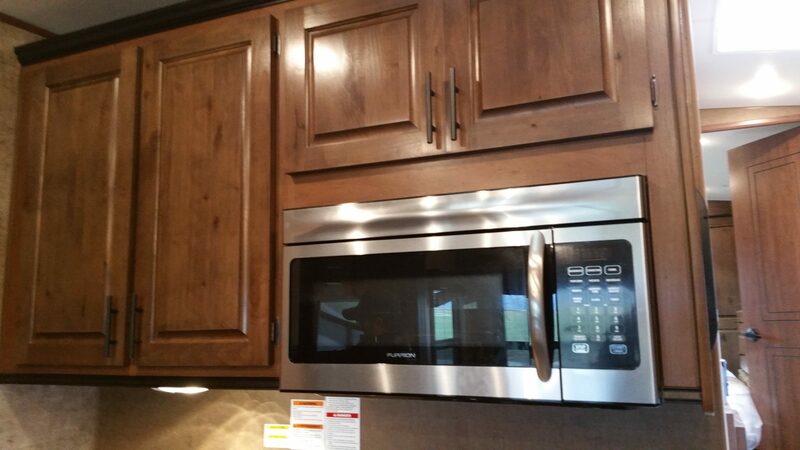 Cabinetry mounted into the aluminum frame which is backed by wood IN the aluminum frame – solid & lasting! 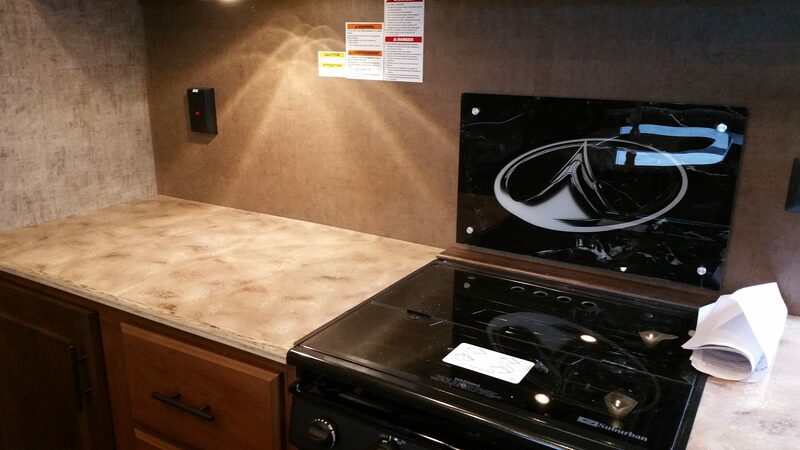 *Refer to an Outdoors RV Brochure – or – Feel free to contact me (traveler@rvacrossamerica.net), I’ll be glad to work with you to help you plan the BEST Outdoors RV trailer for YOUR needs, and get you a fair price on one – remember, I do work for a dealer that carries these trailers. My goal here however is NOT to pitch you, it is merely to inform and you can do what you will with the information. Cabinetry over the recliners – if sufficient room exists. Photo below illustrates what I’m thinking of. 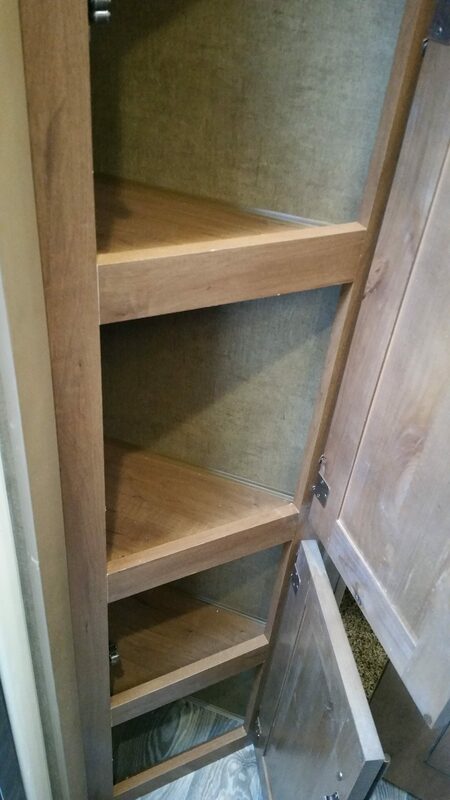 This is cabinetry over the sofa in my current 5er. 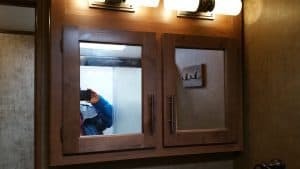 Corner cabinets over the bed as illustrated below (again if sufficient room exists). Hinges on one (or more) of the stairs leading to the bedroom for hidden storage. 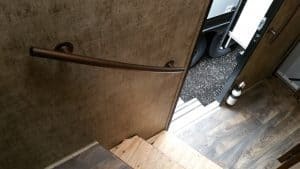 I’m VERY inclined to make this trailer my next – BUT – I’m not going to finalize my decision until I take a closer look at the Augusta RV Ambition 33. 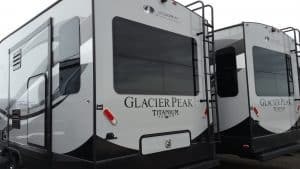 While not (quite) perfect, the Glacier Peak (Outdoors RV) design does fit my definition of a well engineered true 4 season trailer. Having met the factory personnel, I can say they certainly do take pride in what they build. 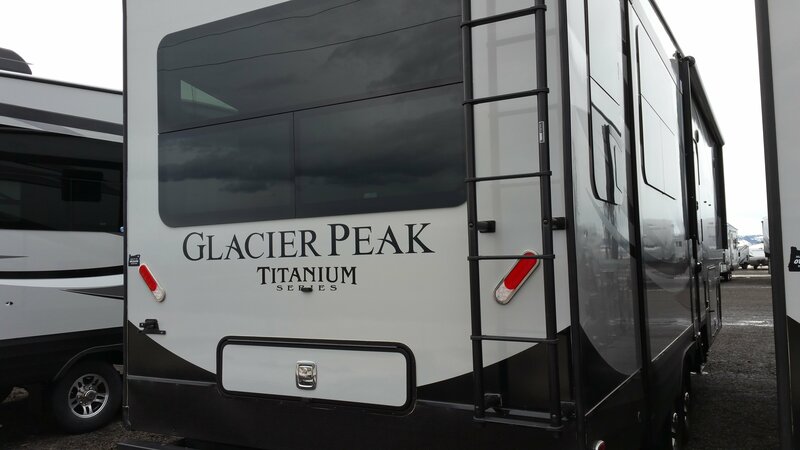 While I’m (strongly) leaning towards the Glacier Peak, there are certain interior appointments in the Augusta RV Ambition that allure me. Frankly it will come down to build quality and not much more when I arrive at my final decision. LATE BREAKING NEWS: In my review of an Augusta owners website, I learned that Augusta-RV merged with the RV Factory in November 2016. Whether or not this is good news or not remains to be seen, but I will certainly be speaking with their internal staff about this significant change – and – what appears to be some quality control issues I’m reading about from current owners of their products. From experience I know a certain number of issues are likely to arise in a new trailer – BUT – the entire reason to move away from the “big boys” (Thor and Forest River) is to see a better and more finished product leave the factory BEFORE the consumer takes possession! 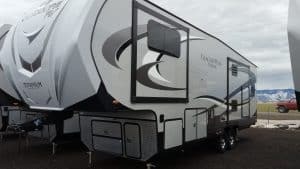 Regardless of which fifth wheel I purchase next, you can be assured, I will be purchasing an Extended Service Contract – click HERE to see why. Hey THANKS for reading all the way through! Enjoy the other articles here on RVAcrossAmerica.net – we’re approaching our 100th article soon! We’re pleased that you’re pleased. Looks fantastic! Appreciate the pics and detailed “fine tooth comb” analysis. Love all the storage that’s beyond what I’ve seen ever. The Ambition 33 is great as well but hitch/trailer weight far exceeds the load capability of my truck. Keep us posted!! The hitch weight on the GP is about 2900 pounds, what is the hitch weight on the Ambition 33? And… thanks for your kind words. tanks mounted the same way? Will have to dig into that to have peace of mind. I’ll ask, but given the detail this company puts into building their frame (chassis), and the fact that its the SAME chassis as used by Arctic Fox, I’m quite confident that their holding tanks are well secured. Does this 5er have a full screen door? 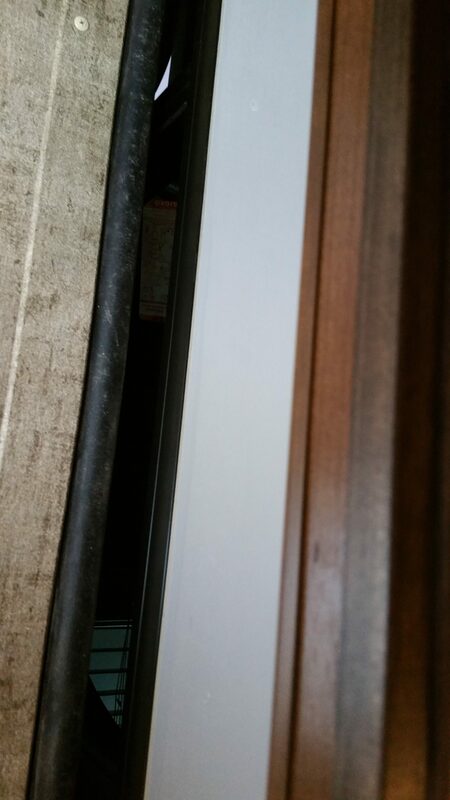 We currently own a 2011 Open Range that we love except for the door without a separate screen door. Even with screen (awning type) open, still feels closed in. 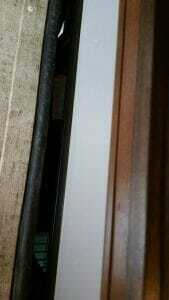 Meet an Open Range owner who found a screen door from earlier Open Range models and had that installed. Wish we had done same!!! I like the model you have shown. Maybe willl go to Hershey, PA RV show in the fall and look for a dealer. I believe it does. You can check the company website – outdoorrvmfg.com/glacier-peak/ and look for the companies photos of the 30RDS. If their photos are inconclusive, you can call them and ask this specific question. 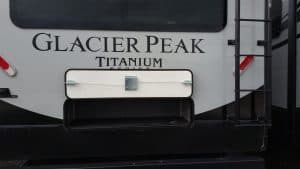 As to seeing it in Hershey, Pa, I doubt you’ll see a Glacier Peak there. Outdoors RV limits their dealer base to the western states. 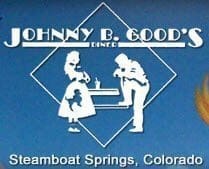 The dealer I work with is in Casper, Wyoming and we are one of the easternmost dealers. Interestingly, when I’m in the store (April – Sept), I regularly receive inquiries and visitors from all over the eastern states. Nice! What part of the east coast are you from? If you’re head out to Casper, Wyoming, I will be in the store in July (Stalkups RV). Let me know and I’ll set time aside to show you the 30RLS. Al PS – there is some great history in Casper, it is the crossroads of all the major 19th century westward migrations. What is the difference between a Mid and Full Profile? I cannot think of any reasons not to go with this unit. I may have changed my mind on what to buy for myself and will have to check out one of these units in person! I like the better insulation package. I don’t like the TV placement, but I don’t watch much TV, so perhaps it is okay. 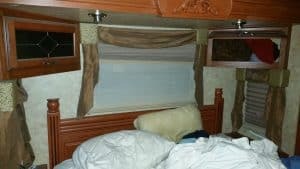 I have looked at some of the HT 5th wheel trailers. They are lighter and thus can use a H)alf T)on truck. I like the concept, but they seem to take the weight out of the wrong items in my opinion. 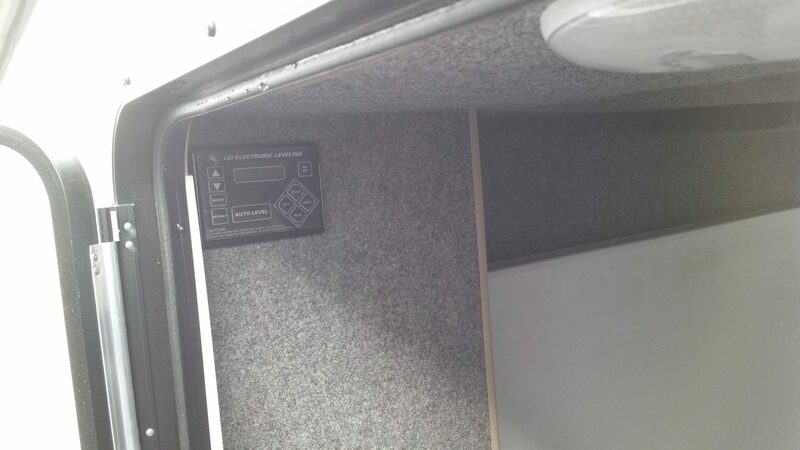 Suggest to Outdoors RV that we can help them to design a HT version. Let us know how you like your new 5th wheel! 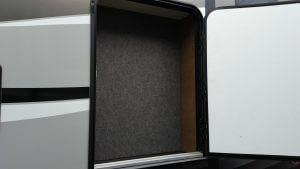 Mid Profile: a smaller overall design, shorter in particular; in the Glacier Peak, the mid profiles have a N/S bed (in the front cap), with a wardrobe slideout – this allows for MUCH less space for clothes storage than using the front cap as a closet with an E/W bed which is found in the full profiles. To be sure, see the outdoorsmfg.com/glacier-peak/ page and look at the floor plans for the 30’s vs. the 26-28 series. I agree on no reason not to go with it! I’m going to place my order SOON. The insulation is exceptional. The TV is in a good spot, no? Across from the lounge chairs? These are NOT half-ton trailers. They have a dry weight of about 12000 and a gross of 15000, the company makes no apologies for saying 3/4 ton or bigger! I’d suggest diesel only!! 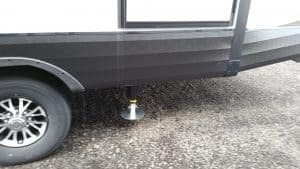 Half ton trailers (eg: ultra lights) DO make compromises and are trying to enable the end user to have a 5th wheel when by all rights – no they should get a well built 5er AND a 3/4 ton truck – BUT – that combo costs more! 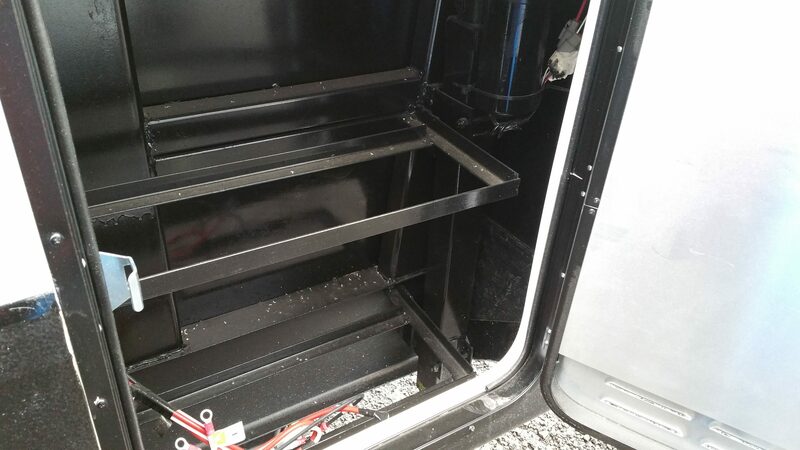 I doubt Outdoors will ever do a 1/2 ton version as the insulation and other design aspects end up producing a trailer that will weigh in well over 10,000 pounds. I will certainly keep you in the loop on how things progress! Very interesting article. 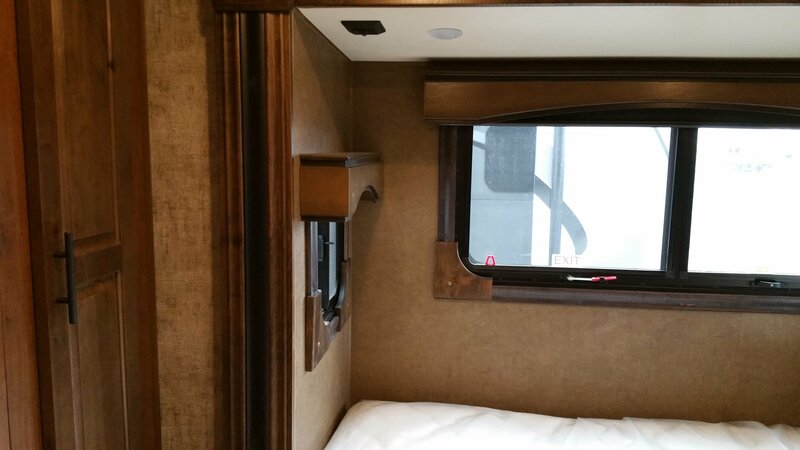 We currently have a Forest River Wildcat 5th wheel and have come to the conclusion that it is not for full time use. After we sell our home, we are going to use the proceeds to purchase a 5th wheel that will hold up better with a lot of moving. Since we live in Maryland, I had not heard of this company. Thank you. I’m quite familiar with Forest River and definitely encourage you to get out of it what you can. As to Glacier Peak, I work for one of the easternmost dealers, when you’re ready, contact me and I’ll be glad to introduce you to the product and find the right Glacier Peak for your needs (there are only 3 I’d consider for full time use!) 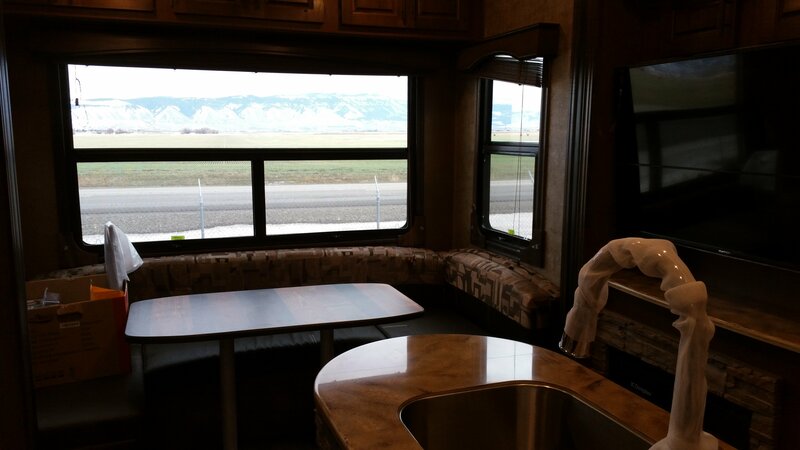 Also – Casper, Wy is a great “launch point” for some exploration of the intermountain west – Yellowstone and Glacier National Park are nearby and there are lots of ‘hidden’ spots I can share with you when the time comes. I just looked at the Ambition too. That looks more my speed! Do you know if these units that are for full timing will have a better axle and bearing system than our Wildcat? 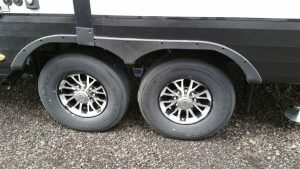 Our 5th wheel is in the shop right now getting a new axle. In October we had bearings go out and had to replace the drum, brake, bearing, etc. My husband thought it must have been that he didn’t have enough grease in there. But on the way home from Florida, it happened again on the other side (same axle) only this time it chewed up the axle. Very disheartening. We don’t know if we did something wrong, or if it was just poorly made. I do almost all of the driving while hubby works in the passenger seat and I am loosing confidence in the camper. We really want to make a better decision next time. We have been across the country to Yellowstone last summer! As well as lots of other travel. 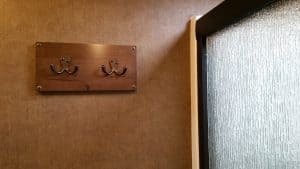 Great blog, look forward to your decision. 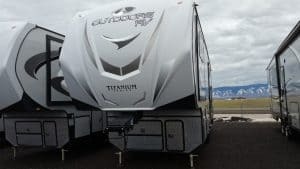 Tia, I work with a dealer in Casper, Wyoming and we sell Outdoors RV (and have a good selection of models in stock at the moment). We have had several folks travel from Ohio and even farther east to get these rigs. The company is great about warranty service anywhere in the nation. If you did opt to travel to Wyoming to get yours, it would be a great launch point for a tour of Yellowstone, Glacier NP, and many other great places to visit in Wyoming and the surrounding region. 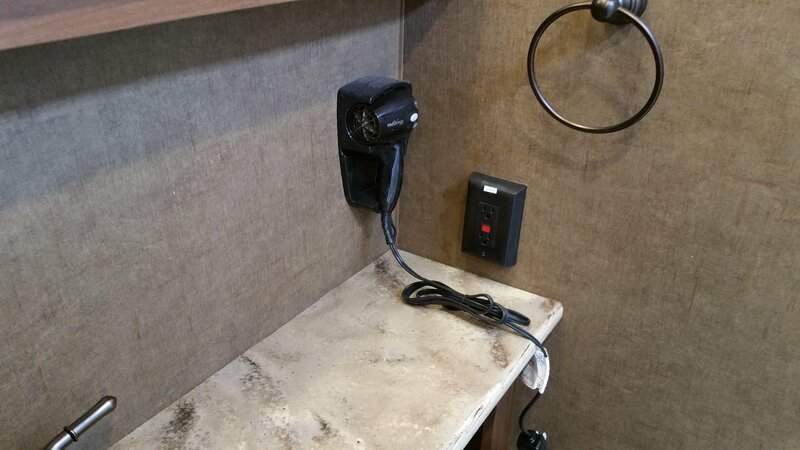 Which Outdoors RV model were you looking at? Alan, I’m looking at the Timber Ridge 24RKS. I really like the layout and options. I do have a question about upgrading the battery from 1 -12-Volt battery, to 2 – 6 volt batteries and if that is even possible. I plan to do some dry camping. Thanks for your help and informative videos. You are helping me make up my mind. Tia, the 24RKS is a beautiful trailer. In fact, we (in Casper, Wyoming) have a new 2017 24RKS on our lot in Titanium. I’d be glad to get you a price on it if you like. What part of the nation are you in? As to 2- 6 volt batteries, its a common arrangement we use on these trailers, so, yes, it will work and at my store, we’re familiar with how to do it. Alan, thank you for the info. I’m in Ohio, a little north of Cincinnati. 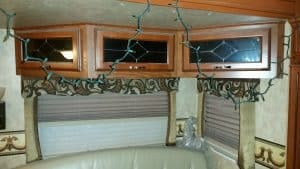 I have been researching RVS for my retirement in a couple years. I can’t wait to be free and on the road. I really like the Outdoors RVS. 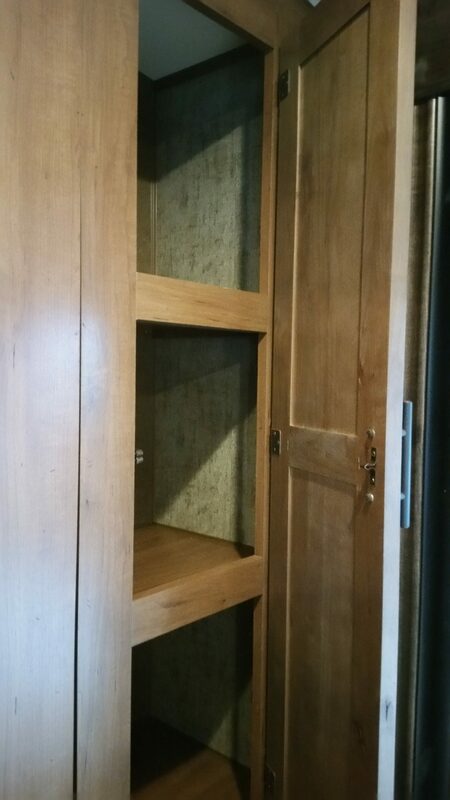 They are made very well and have just about everything I want in my trailer. Can a fireplace be put in the 24RKS? I just thought of that. 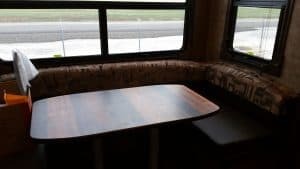 What is your evaluation of Forest River “Cedar Creek” Line of 5th wheels? From what ive read and heard they get very good reviews for 4 season build quality but just not the shorter floor plans. Thanks for your prompt reply and information. My goal is full time rv living so this will be my house. This means I can spend more on the right build/ floor plan. 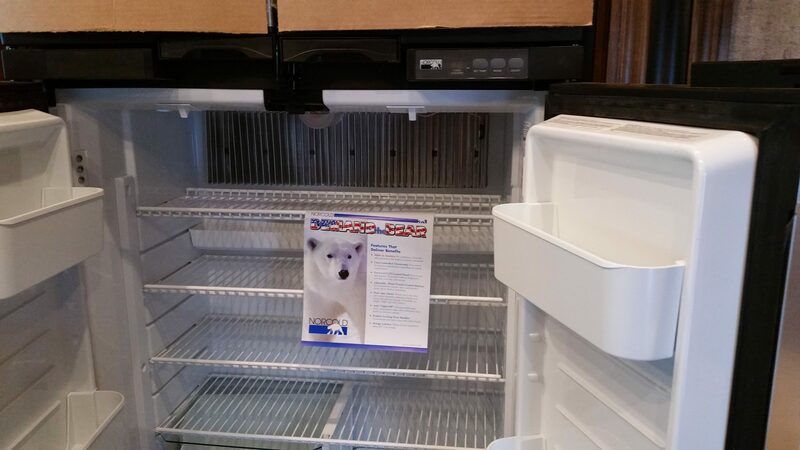 Like you I also considered the Augusta ambition line which has good wall thickness and insulation and great storage and floor plans price range could be up to 80k. 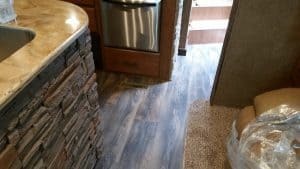 As I watched ur video I cringed because I stupidly bought a forest river Rockwood tent trailer as my first rv. Fun but a cheap piece of crap. Any insight would be greatly appreciated and thx for the great videos. I am in Nevada in the Carson valley. I did look,at the glacier peak lineup this morning and they looked pretty good to me…any local dealers have them? 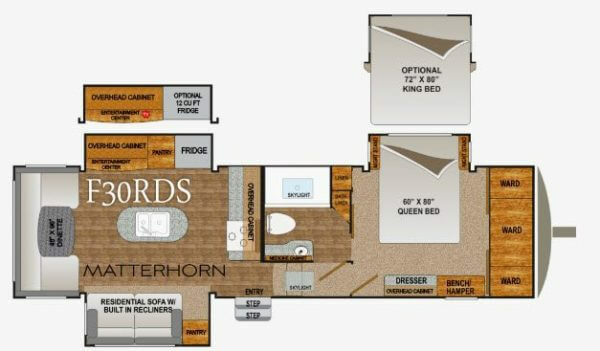 I did look at the Glacier Peak floor plans and although nice, I didnt feel great about them. 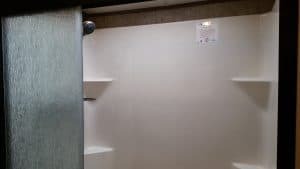 I get that were looking under 34 ft here but even at 35 ft , the amenities seem to change quite a bit. 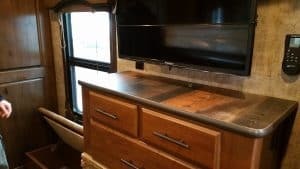 I know you have somewhat of a vested interest in outdoor rv’s as you worked there if i recall, but I’m frusterated with the fine line in length to options. Also a few more makes I was curious about your opinion.. 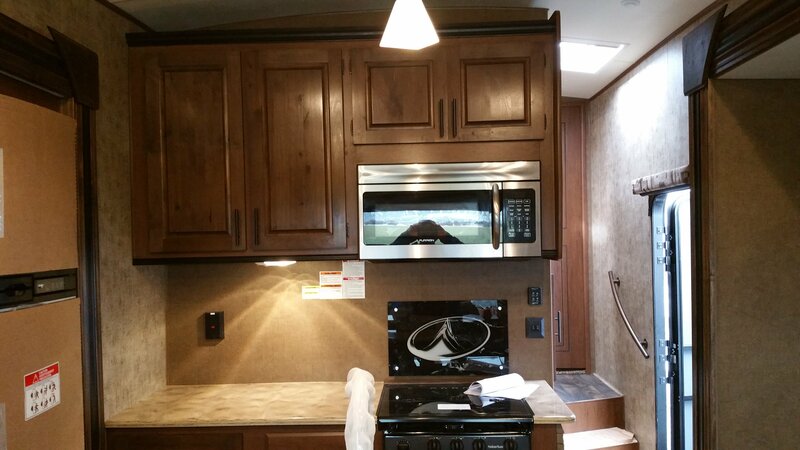 These have a minumum of 34ft floor plans but look to have great full time reviews and option packages. Allow me to clarify a couple of misconceptions – I do not nor have I ever worked for Outdoors RV. I do work for a dealer in Wyoming who sells these trailers, but frankly I would have been VERY happy to find something better to drive to his “doorstep” had there been something. 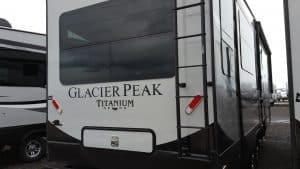 I spent TWO YEARS doing research TRYING to find a better value than the Glacier Peak 5th wheels – and… nothing else comes close, period. You can choose to see that as a sales pitch, many in our skeptical society would, but the proof is in the pudding… I put my money where my mouth is. I OWN one. Now… as to the others you named – Montana – great floor plans, I’ve never seen anything FALL APART as badly as Montana in cold weather, conclusion: Keystone crap. Grand Design: after a 30 minute conversing with one of their engineers – I rejected them…on SEVERAL counts. Cheap chinese tires (westlake), poorly designed steps (the new “better” ones), NO protection over the tires (aka – steel plate) to protect the interior of your camper, NO fiberglass under the slides, LESS insulation all around than the Glacier Peak, so… they’re done in my book. Coachmen & Palomino – these are FOREST RIVER (do the research), they simply HIDE their ties to FR by not including FR in the name. Sneaky huh? 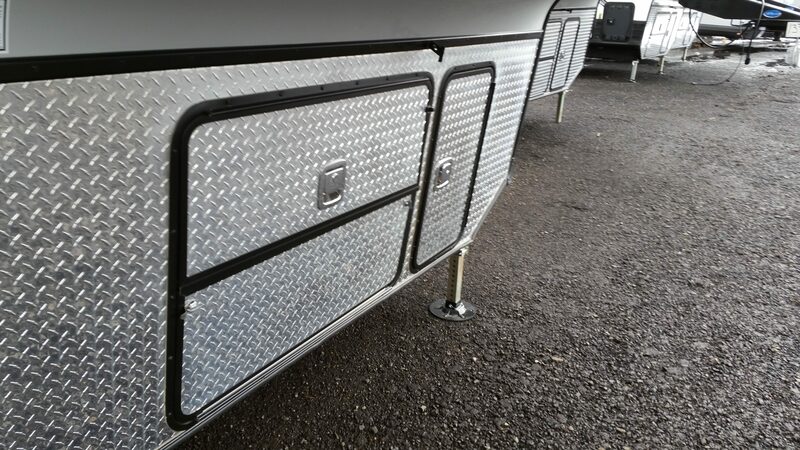 Now… as to Glacier Peak, the 30RLS is 34′ 11″ bumper to hitch and the 30RKS is 33′ 9″ bumper to hitch – those are the REAL lengths which is how any trailer should REALLY be viewed. As to options, what they offer simply makes sense. If you can find something they do not offer, let me know and we can talk about it. Last – is the 30RLS (the trailer I’ve purchased) my “dream” floor plan? Nope. I’d rather have a center island. BUT… I live by my words – I choose design, engineering and build quality OVER floor plan. The rear living is “good enough” for me, so, I can live with it. I am going to make some modifications once I’m in the trailer. Oh and you mention – “great full time reviews” – be careful. 99% of those reviews are either by the company itself OR by reviewers who really don’t know what they are talking about. Sorry to seem “heavy handed” in that statement, but I am AMAZED at the number of people who THINK they know what they’re looking at when they clearly do not. Thanks for the very insightful follow up. With all the noise and sale push it can get convoluted and confusing at times. I just want to make sure im getting what i want for the long term. Do you know of any Glacier Peaks in or near my area? Sorry , i meant to delete the Forest River model out…..
Alan, now that you’ve had your Glacier Peak for a few weeks, does it live up to your expectations? We are looking at the 2018 F30RDS. You did not mention that model. Any reason for that? What do you pull your Glacier Peak with? See prior message for thoughts on the trailer; I have a 2015 Ford F250 DIESEL SRW, it pulls just fine. I would NOT want a dually and I do NOT need a 1 ton! Today must be my lucky day ! I have followed you in the past and then strayed away for awhile. But this morning my computer directed me to your videos, advice, and experience. We’re heading into full time RVing in 2018. Choosing and RV, when to buy, where to buy, are all subjects you’ve covered but we have somewhat special circumstances and would greatly appreciate your opinions. I can’t find where to email you directly. Please help.